It’s about time we had a little chit chat. You already know I’ve been battling to clean you up but good. We’re coming along nicely. But you’ve been continuing to taunt me in ways that have had me a little scared, and playing safe. Safe isn’t very exciting, is it? I was gonna be so smart and just quickly paint this very boring hallway, complete with sticky labels all over two doors. They’ve been like that for YEARS because I’ve been ignoring this area. See the white wall to the right? I was on such a rampage this day, that I nearly forgot to take a before pic. So with wet paint on my hands, I grabbed this phone shot before it was too late. Well, the hallway just got wrapped up tonight. The white walls make the wood floors even woodsier! I could have called it a day, and flicked off the lights and decorated it with something nice tomorrow. That would have been safe! The mouldings had to go. HAD. TO. Look now much sharper things look already! Can you see what I see? See, thing is, I’ve stared at those mouldings for how many years now? 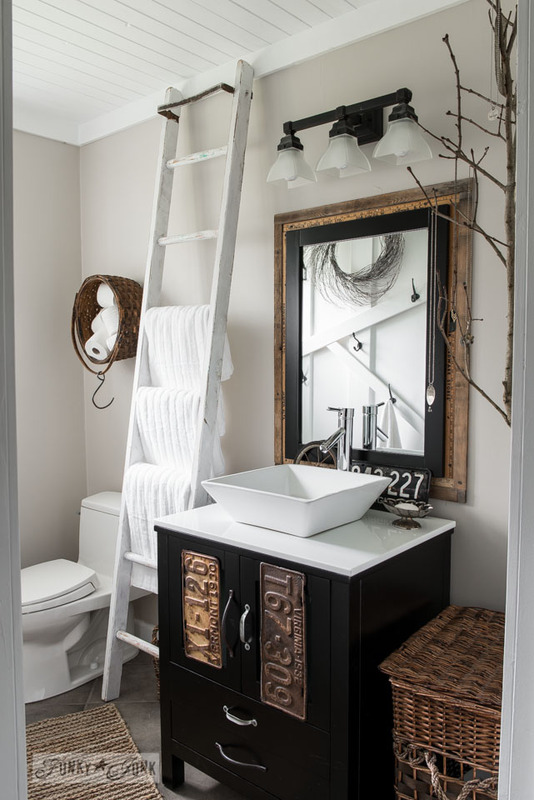 Ever since I did the salvaged farmhouse bathroom reveal, <— click for reveal / that’s how long. THIS is the look I am going for. So while I painted, I mumbled about you. Playing it safe. I’m braver now. And know what I like. And what I can do. I want my farmhouse window moulding around the doors. You’ll thank me soon. I promise! I’m going wood shopping tomorrow, but will make it as painless as possible, and purchase pre primed wood where I can. I even played with a hallway door idea. I tried to distress it but it looked wrong, so back to solid it went. I’m still thinking about this. I’d like the doors different, and the chocolate is gorgeous, but I’m not sure it’s the look I’m going for. It’s a bit new. What I REALLLLLLLLY want are all different vintage doors in all different wood tones. Maybe even left stripped. It’s my bet that they’d all be diff sizes… so that won’t work. Any ideas on what you’d do with these doors, everyone? Maybe I’ll COVER them with wood! House, shush on your safe ways…never you mind. In other GOOD news, this one wall in the living room is nearly done… so fresh, light and amazingly white! My head is spinning with the next steps! The grey rock on the fireplace is so striking against the white! But that popcorn ceiling is interfering with my unsafe plans. I’m trying to ignore the popcorn ceiling, but I’m not certain I can. I’ll do the hallway moulding, and think just a little bit more. 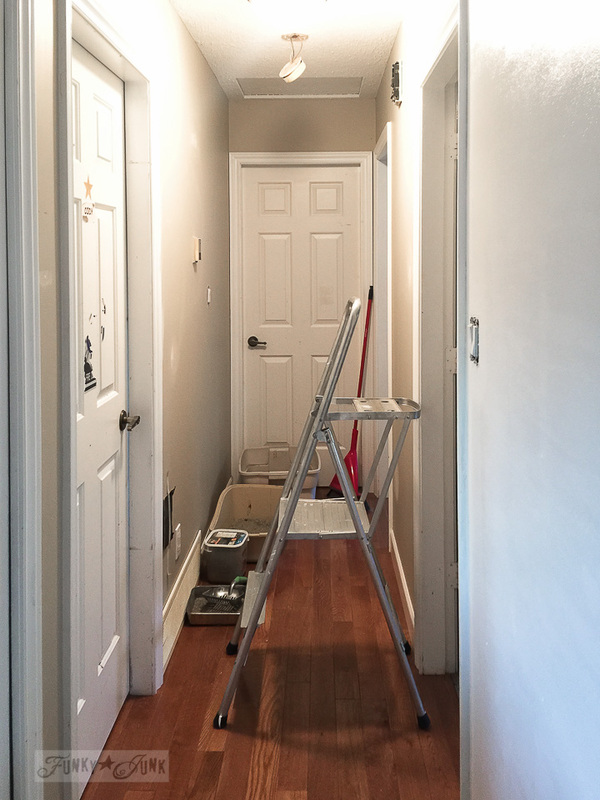 For some reason, I have a feeling EVERYTHING about this mini reno will be done backwards. And that’s what playing it too safe does. It scares you from going for what you KNOW in your heart of hearts you want done. It’s one thing to not know. But I do know. Here’s to not playing it safe anytime soon! What Christmas Tree? Hello Farmhouse! And what did you accomplish over the last 2 weeks? If you blogged about it, share your link with your comment so we can visit you! Everything looks so fresh and pretty. It really makes your other things pop – love it! I haven’t done any projects except a new branch-ey nature thing to hang over my mantel for Christmas – it will go up tomorrow. But there are lots of bigger projects waiting in the wings – the next being the headboard for my bed so that I can finally pronounce my bedroom DONE! LOL Have a wonderful Thanksgiving! 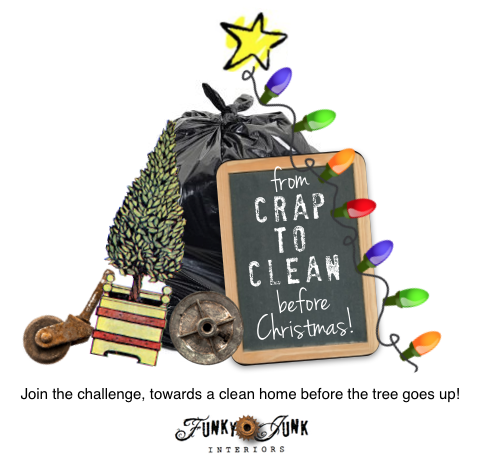 get rid of the popcorn while you got the mess….it’s an even bigger mess. You’ll be glad you did. Love Love the molding and can’t wait to see the doors. Love the white!! Gonna be beautiful!! I love your enthusiasm and new purpose. Happy Thanksgiving. 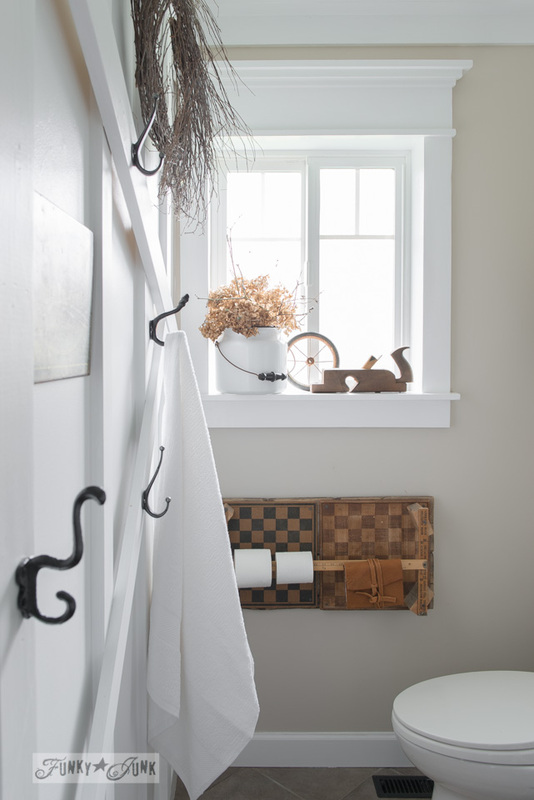 I love the farmhouse trim! I’ve recently had all new trim installed in our main living areas & love it though mine is not white. It’s a pale pecan stain – kind of Scandinavian – I really love it & have dreamed of it since I was young. 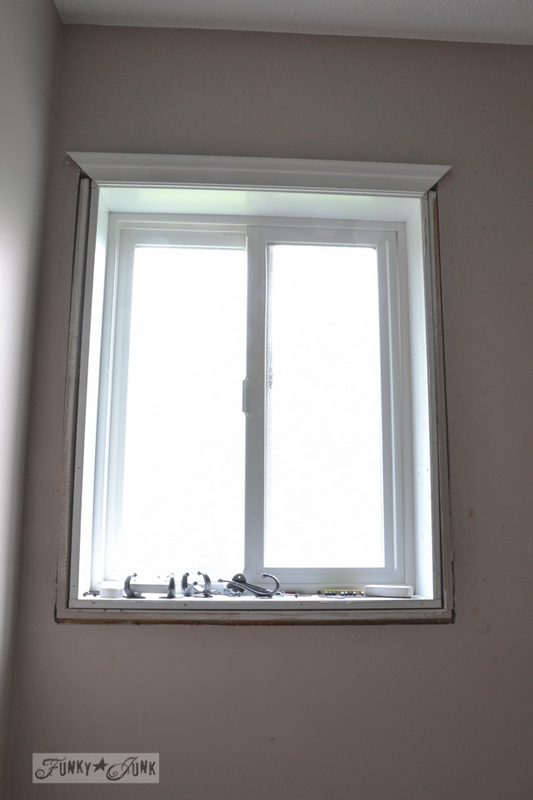 Of course, your door trim can be easily made like your window trim! I’ve been renovating an old house to become my workshop and store. This includes demolishing, drywalling, painting, floors, etc. etc. You MUST do all different doors! I cant think of anything more perfect. Just buy larger and cut down. That way they will look even more kwirky. I know you can do this! Great work Donna. It’s so fresh and crisp. You could make some barn style doors. We have some in our house and they are a really simple design made from unpainted wood which has a bit of varnish on them. The wood is imperfect with the odd chip out of it or past woodworm damage etc to add to the character. Ultimately I would love sliding barn doors but I am still very happy with the very rustic swinging doors we have at present. Good luck with everything! My living room is painted pumpkin. One of my sons thought I was crazy until he saw it. The woodwork is natural and the ceiling is white. 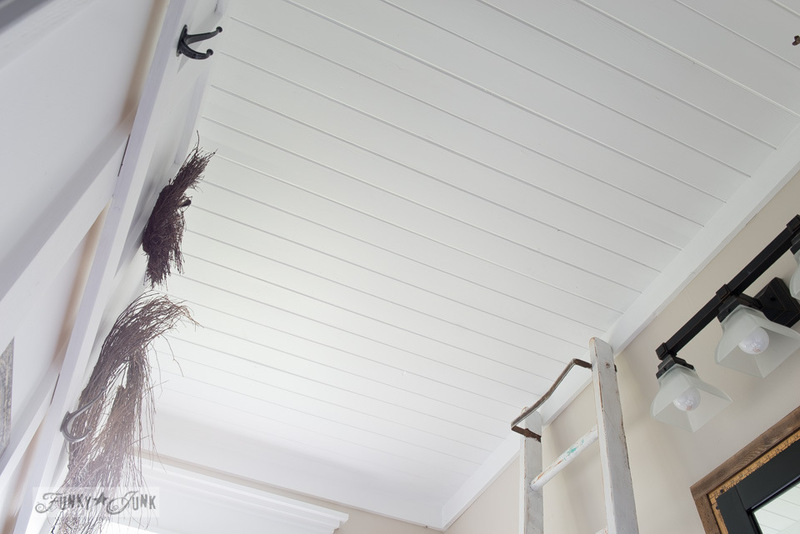 I am going to put bead board on the kitchen ceiling as soon as I can get to it. I love what you did. 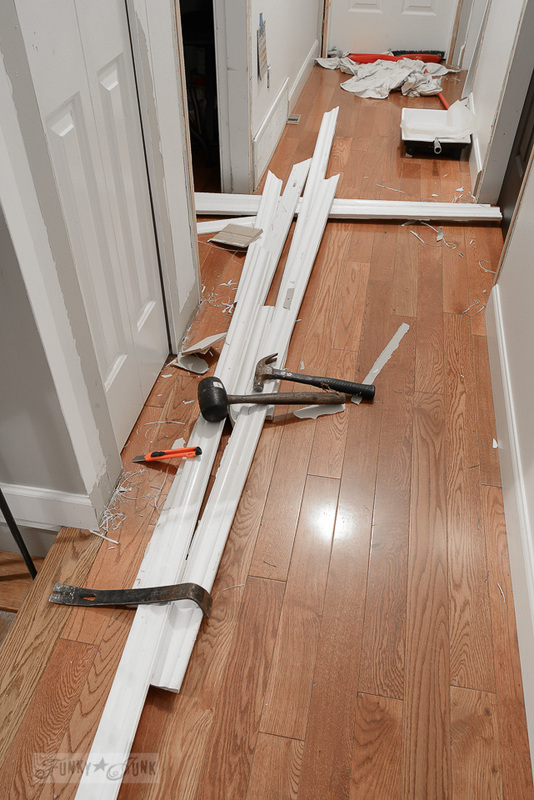 I had my entire house redone with the moldings like you are doing. 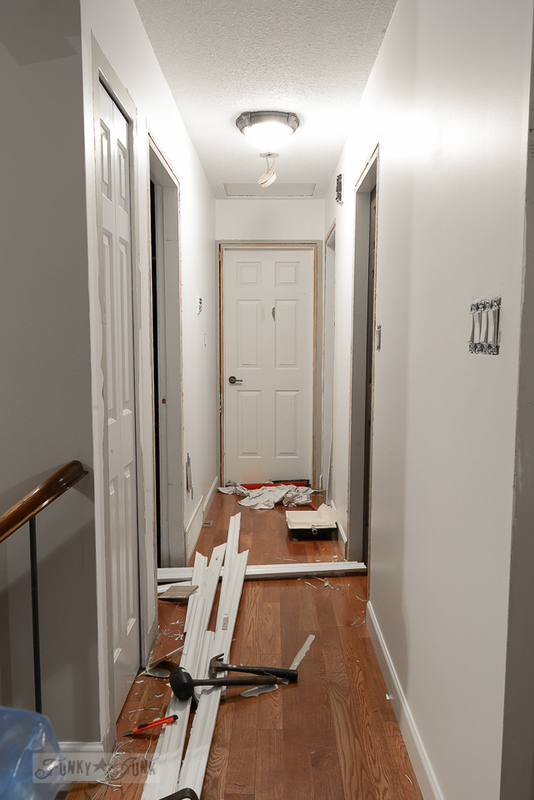 Baseboards, windows and doors. Now i need to paint it white. I would love to make my doors look like the old doors that had 5 rectangles. I’ve seen how it can be done with 1/4 inch plywood. I REALLY want my ceilings planked. 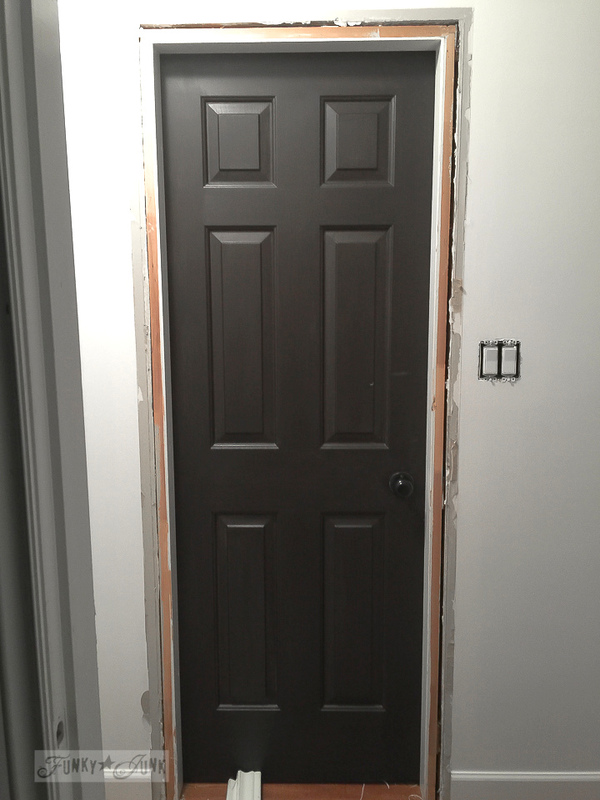 Remodelaholic shows how to make the 5 panel doors. I would love to send you pictures of my kitchen. I don’t have a blog. I went white with in a lot of our rooms starting several years ago and still love the Simply White. 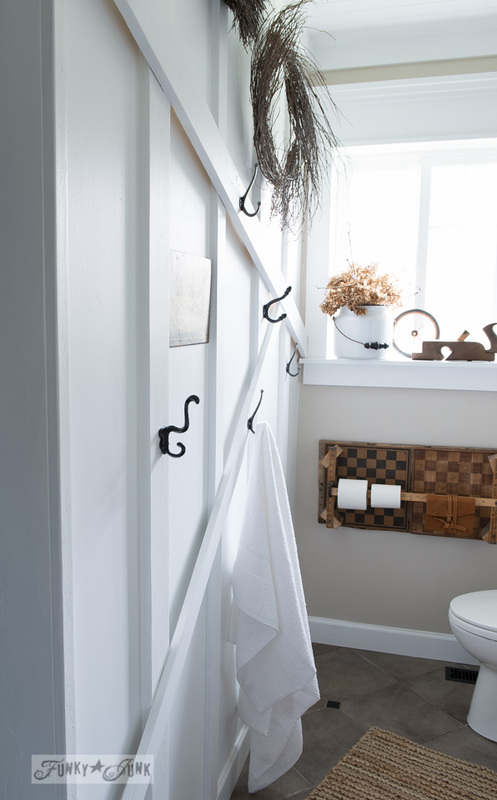 My most recent blog post shared all our white walls and those that are going to be white in the New Year. 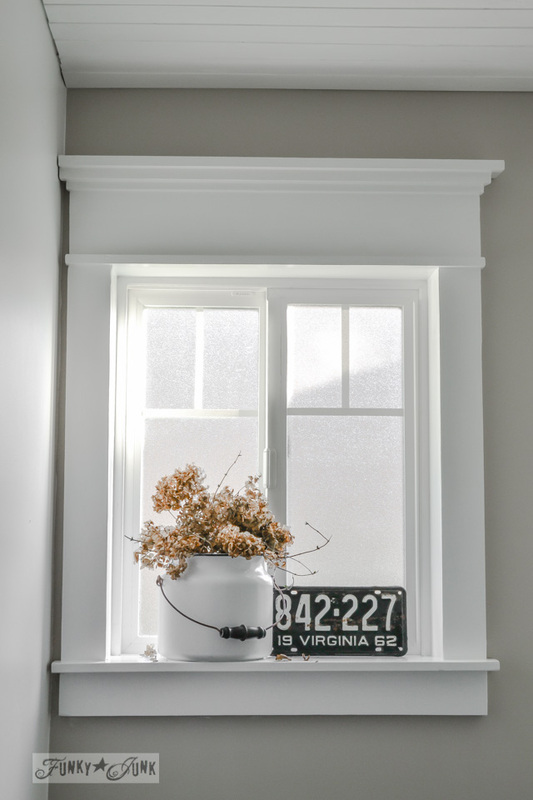 I have loved that farmhouse window trim ever since you did it, Donna. I plan to add some to the window going up the stairs. 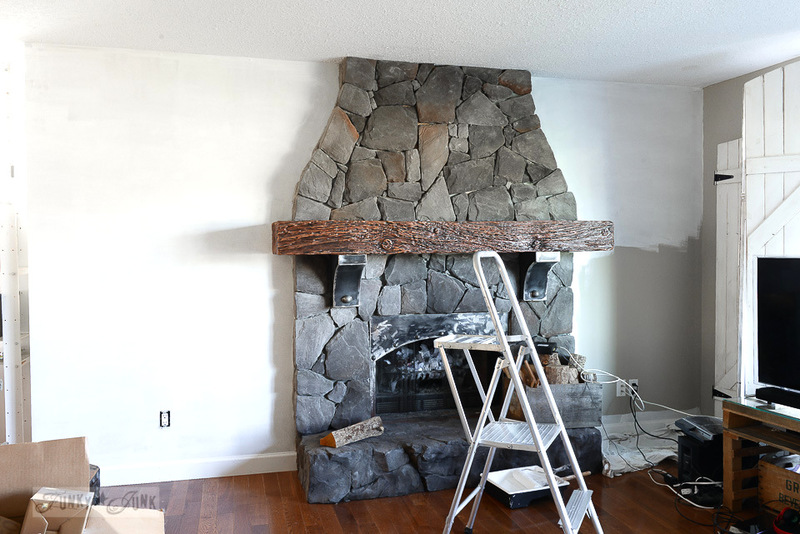 Your fireplace brick is going to look fabulous with the white wall. Our boys stripped most of our main floor popcorn ceilings and it looks so much better. I plan to plank the living room ceiling and catherdral ceiling in the family room/kitchen when we have extra money. Looking forward to seeing what you do with your doors. While you have the living area in a remodel mode, remove the popcorn off the ceiling. Cover the floor with a tarp, put hot water and a drop of dish soap in a sprayer and spray about a 3′ x 3′ area starting in a corner of the ceiling. Let the water soak in for 30-60 seconds then take a wide drywall knife and scrape off the popcorn. It should come off in sheets which is virtually dust free. Continue over the ceiling until all the popcorn is removed. After doing this with a ceiling in a previous house, I then lightly skim coated the ceiling with drywall mud, leaving some “trowel” texture. This was a lot cheaper than any other ceiling treatment I had considered and liked. I also skim coated most of the walls to get rid of the”orange peel” texture I hated. Love your blog!! Hi Elayne, thanks for this advice! Does it also work with painted popcorn ceiling? Donna, I don’t know how well this technique will work with the popcorn texture painted. Try a small section and if it doesn’t work then you might score the texture and then see if it will absorb the water. Another way ~ is to use the same solution as Elayne but use a paint roller to soak the ceiling… I think you could cover more area quicker. I know how you feel with the doors. I have flat luan doors in my house and have painted two of them, but after looking at them for a couple months, it doesn’t sit well with me. They will wear a new coat of paint soon in a different color. I would love to get rid of these cheap builder grade doors and begin replacing with beautiful old doors. I say start replacing the doors with old ones with character. It’s what you really want and your inner voice won’t let you be until you do it. It may take a while to find each door, but that’s part of the evolution process. I love that you’re going to beef up the moldings. Looks beautiful so far! I have not done this yet- but I’m totally with you on the doors. I redid a pot rack a while ago by distressing it and I’m thinking about doing some doors the same way. Of course they need to be sturdy, but if they are what about taking those suckers down, beating them with chains and a hammer and then chalk painting over that dark brown with some sanding to finish them off. Not quite the same as the old peeling paint look (which maybe you could get by painting a ton of coats and then using a paint stripper to give the look you want) but I’m ready!!! Really unique ideas Roz, thank you for that! I’ll keep it in mind as I think it through!